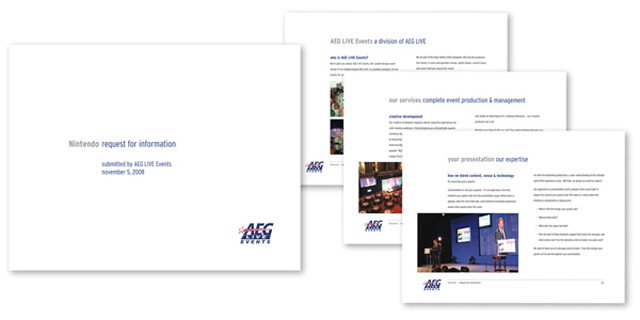 AEG Live Events: RFP - TriFecta Creative. Graphic Design and Creative Services for Your Business. Worked with client to develop creative Request for Proposal document under an extremely tight deadline. Document needed to outline client’s core competencies and do so creatively. We conceived of a minimalist design to give the client’s outstanding event photography room to shine. Coordinated production of books with client, producing final pages on thick foamcore board which had the desired effect of putting literal weight behind the RFP.